Taco Bell is keeping its Super Bowl plans so under wraps that not even the celebrities in its ad know what they're selling. At least that's what the brand wants you to believe in its first teasers that launched today. 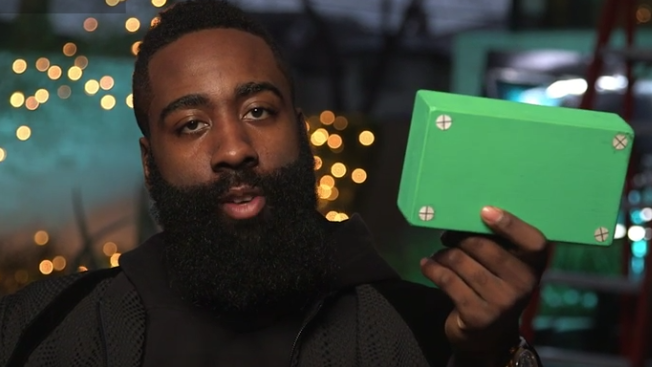 NBA player James Harden; TV personality and so-called "alien expert" Giorgio A. Tsoukalos; and Bryan Wilson, a Texas attorney famous for his viral YouTube ads, star in three teasers promoting Taco Bell's Super Bowl ad. The problem is that none of them actually knows what the ad is about. "Apparently it's about a mystery product that I even don't know about," says Tsoukalos in a 30-second clip. "It almost seems like it's a conspiracy." In addition to the teasers, Taco Bell has set up a cryptic site where people can pre-order the mystery product, which costs $2.99. Folks who order this week can pick up their food from 2 p.m. to 4 p.m. on Saturday before the brand's TV spot airs. The item will then be sold nationally on Monday, Feb. 8. The new 30-second campaign promises to be one of the taco chain's "biggest launches to date," and some are speculating the new menu item could be a Quesalupa—a cheesy chalupa. This isn't the first time Taco Bell's marketing has built mystery around a product. In 2013, the brand used social media to tease a new Doritos Locos flavor and famously wiped out its social media accounts to launch a mobile ordering app in 2014.